Once a basic level of comfort was established, Dr. Hacket could begin caring for those who were sick with typhoid fever and try to prevent the healthy from catching it. He developed a diet suited to the settlers’ habits and customs. Since these were poor people, he based the food choices on what he understood to be their regular diet: potatoes, milk, oatmeal, butter and a little meat (two days a week only). For the truly sick, meals could also include tea, sugar, wine and bread. After only six days, the patients’ health had improved, but Dr. Hacket did not relax his efforts. Though the patients could be released from quarantine since they seemed better, Dr. Hacket noted that they were impoverished as well as exhausted from their voyage. These conditions could lead to a fresh outbreak of the fever once they rejoined the general population, and the sickness might spread throughout the colony. However, the doctor’s fears do not appear to have been justified. The last Irish settlers left Île au Ruau around the end of August, and no typhoid fever epidemics broke out in Lower Canada in the following weeks. The letter shows the situation increasingly faced by health authorities in the colony. The government and the elite came to understand that caring for the sick required more than a temporary camp on an island. As a result, the Hospital for Reception of Sick Emigrants, the first hospital in the city of Québec for immigrants, was established two years later. It operated until 1834, when a new hospital, the Marine and Emigrant Hospital, was built to care for this clientele. The hospital remained in operation until 1890. 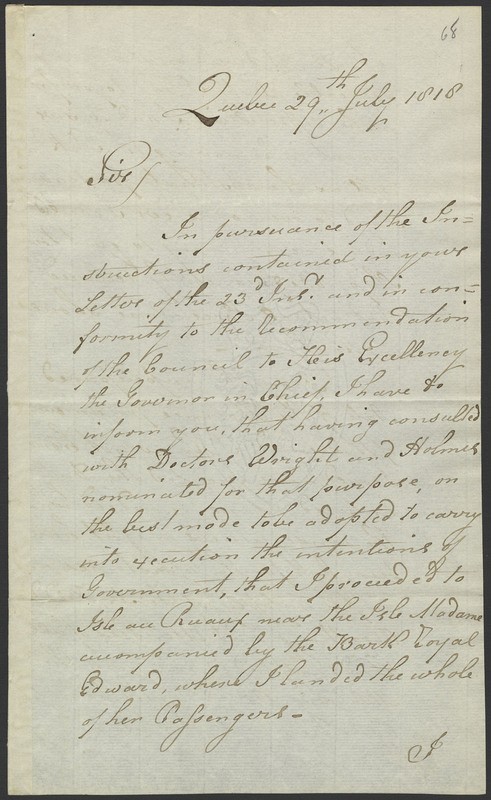 RG4-A1, volume 180, letters from William Hacket, dated July 29 and August 25, 1818 (MIKAN 126122). Goulet, Denis and André Paradis, Trois siècles d’histoire médicale au Québec. Chronologie des institutions et des pratiques (1639-1939), Montréal, VLB, 1992 (AMICUS 11892694) (in French only). Lépine, Véronique (under the direction of Jacques Bernier and Rénald Lessard), Guide des archives hospitalières de la région de Québec. 1639-1970, Bibliothèque et Archives nationales du Québec, January 2003 (in French only). Martin Lanthier is a reference archivist in the Reference Services Division of Library and Archives Canada. This entry was posted in Immigration and tagged disease, immigration (Ireland), Lower Canada, medicine by Library and Archives Canada Blog. Bookmark the permalink.